Read this section very carefully. Click to Submit,then call in. ​Owner ext. 806, the founder of W.O.N. Ms.Melendez knew her rights(as per studies for years,and each time she was being violated in the "family superior court. "She then realize her time left to sue,and made sure she did just that." 118+lawyers from California,NJ,NYS,to PA.,Delaware,to MD.,MI.,all over nationwide,attempted to say,"you can't sue dcf.,'But she knew better. SMILE... 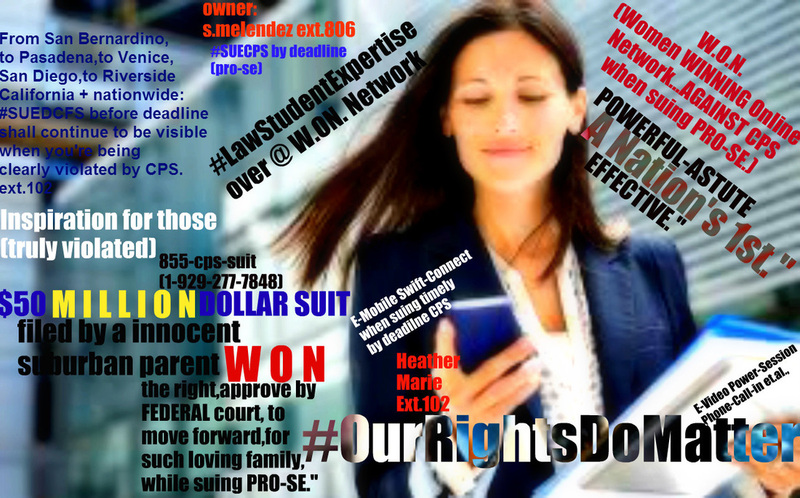 When you're feeling at "that very moment" you're actually SUING employee at CPS after so much severe agony/pain/suffering that has been forced upon you and your family." When so many assumed they were NOT capable,to sue despicable Department of Children and Families,dcfs dss,dyfs,abhorrent caseworkers accountable. . . "
When a social worker,caseworker,supervisor @ CHFS, OJDFS,DHHS, DHR,DCYF,DFPS,DYFS, DCPP, CYS, DHS, DSHS, DHHS, DFPS, CHIPS,CPS,DCF,DCS,DSS, DCFS has violated one's fourteenth fourth amendment et.al., right you're in a position to file your claim,tort, suit et.al., immediate. Do not wait until deadline pass you by everyone. . .